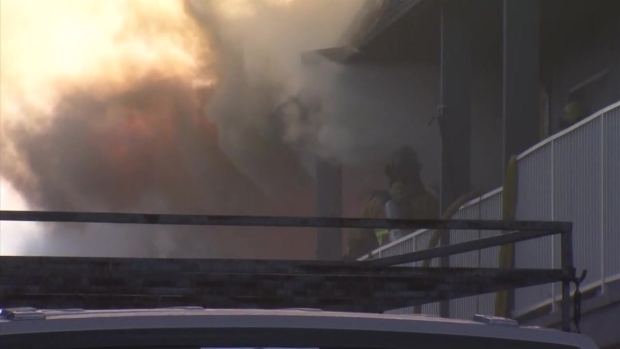 A fire broke out at a two-story apartment complex in Chula Vista Monday morning, injuring two people less than an hour after another fire at a neighboring mobile home park. The fire sent flames pouring from the window of an upper-level unit of the complex located off of E Street near Broadway at about 7:15 a.m. Monday. Residents described being awoken to screams and peering out their windows to see flames pouring from one of the units. "We woke up this morning hearing people screaming and everything. [They were] telling us we gotta get out now, smoke inhalation and things like that," said Steven Aires, who was evacuated with his girlfriend. 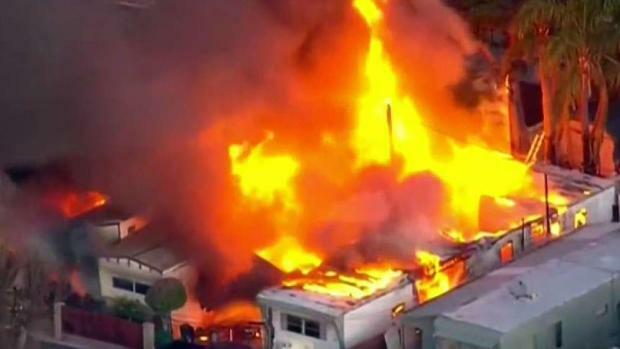 A mobile home park and an apartment complex a block apart both caught fire within an hour in Chula Vista. NBC 7's Rory Devine has more. Families frantically grabbed pets and accounted for their loved ones as they ran from the burning apartment complex. "I was panicking, I was scared. I thought the fire was spreading even more," Aires said. At least one person was injured, possibly with burn wounds, a fire dispatcher said. Another person was treated for smoke inhalation. At the scene, a woman was carried out of the complex on a stretcher. The Chula Vista Fire Department was called to temper flames but the fire damaged or destroyed seven units as it burned. Resident Ellery Paker said he was grateful the crews were able to prevent the flames from spreading. 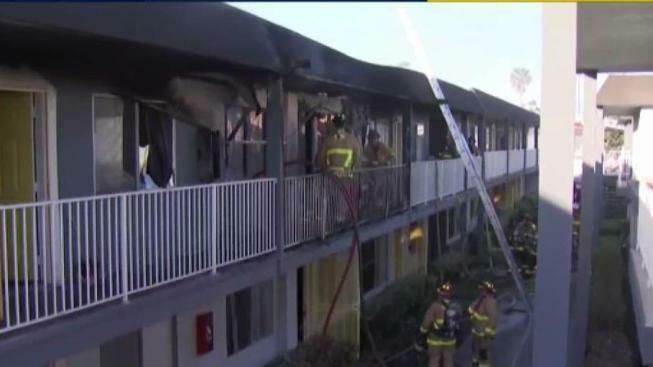 One person was hurt in an apartment fire in Chula Vista on Monday. The fire broke out less than a block from where a fire destroyed a mobile home about 30 minutes earlier. "I got to give it to the fire departments because I know I'll have a place to go back and lay down and go to sleep tonight because of their work," he said. A Chula Vista city spokesperson said that 36 units in the complex are uninhabitable. The fire erupted about 30 minutes after a fire broke out at a mobile home park a street away. Ffire officials do not believe the two incidents are connected. The Red Cross announced it would open a shelter for those affected by this fire and the other fire at a neighboring mobile home park. Displaced residents were welcomed at the Otay Recreation Center, located at 3554 Main Street, beginning at noon Monday. The Red Cross said it would offer “a safe and clean place to stay, food, hydration, comfort kits with personal hygiene items, emotional support and health services,” in a released statement hours after the fires. By 10 p.m. Monday, there were about a dozen people sheltered there. The Red Cross said it is prepared to house as many as 60 indefinitely. The non-profit also welcomed pets thanks to the help of the San Diego Humane Society, which open a pet shelter adjacent to the Otay Recreation Center.